Owner: looks like they are about to fall asleep, certainly not interested in reviewing yet another useless report, asks, “When will the project finish?” Because, as we all know, this is really what they care about. Owner: sighs and goes back to checking e-mails on their computer. Owners and Executives have a lot of responsibility and hence do not have time to review detailed plans and activities, nor should they. Additionally, Contractors DO NOT want Owners second-guessing them throughout the project lifecycle. Sensing the need for the Contractor to show the Owner a crisp, one page, informative document that can be kept at an extremely high level, and the Owner’s need for a proper project summary that has the ability to address the health of the project and lead to good discussions, I created this template. As you can see with this form of Milestone Status Report I kept the durations at a high level with 1-week increments. Depending on the length of the project, duration increments can be changed to 1 month and potentially fiscal quarters. Typically Owners and Executives aren’t interested in the exact date the project will get turned over but they do care what week, month or quarter they can start moving in furnishings or communicating with different contractors. By filling in the boxes with the appropriate the color, this report becomes very informative. 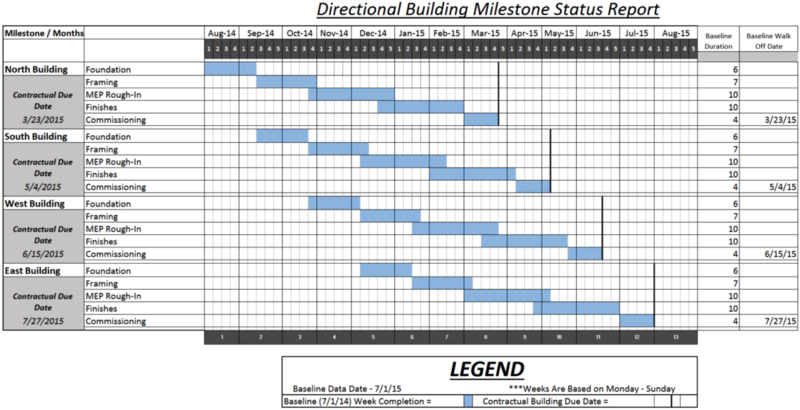 With one glance, a user can see on the Gantt chart the rough duration between 2 milestones in comparison to the end date. Vertical yellow lines capture the timeframe in which the report is being generated. Salmon color represents the overlay between baseline and actual/projected with a solid green being an early week completion and red being a delayed week. The light blue signifies when the project team was projecting the milestone to start. Difference in Duration column and Amount of Early/Late Days are always calculating from the baseline. With this update, because the project was showing delay, I added a column that calculates liquated damages. 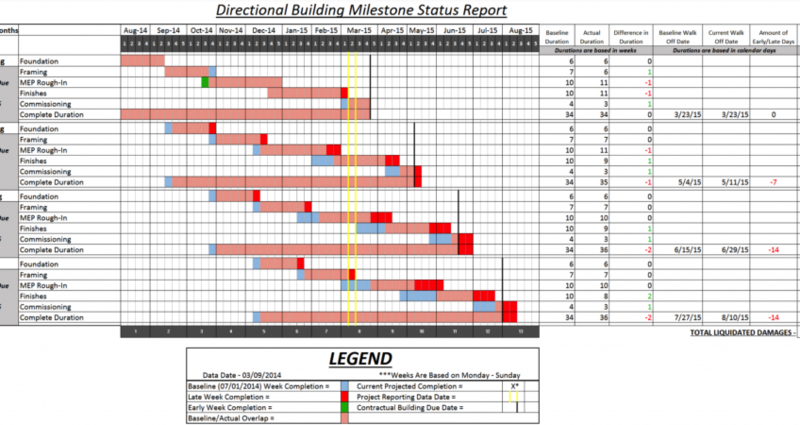 Even though I placed the liquated damages (L/D’s) of all 4 buildings the same, $1000 per day, you can start to imagine how if the L/D’s on one of the building was substantially higher than another this report can help identify and inform a manger of best approaches to mitigate. CPM Contractors is a consulting company that specializes in Scheduling, Planning and Risk Management. Copyright 2015 CPM Contractors. All rights reserved.